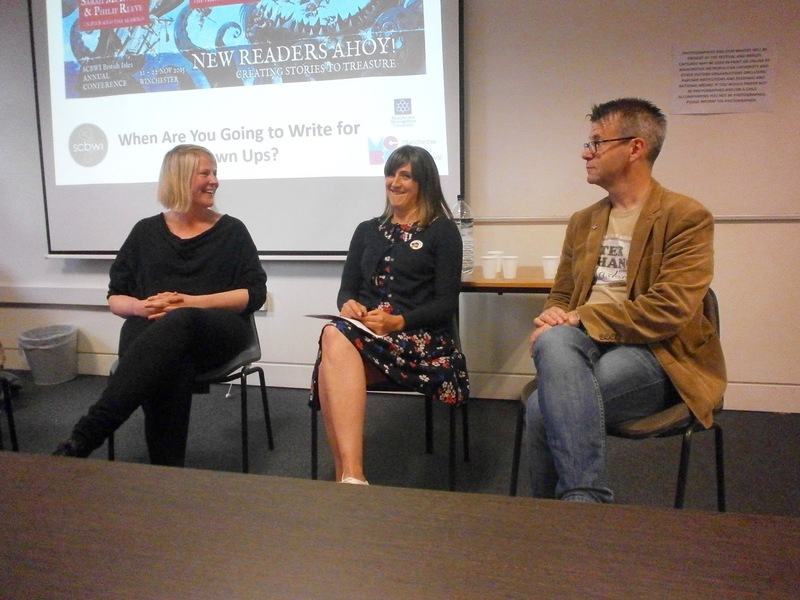 On 26 June the North West branch of SCBWI hosted a panel event at Manchester Metropolitan University as part of the Manchester Children’s Book Festival. 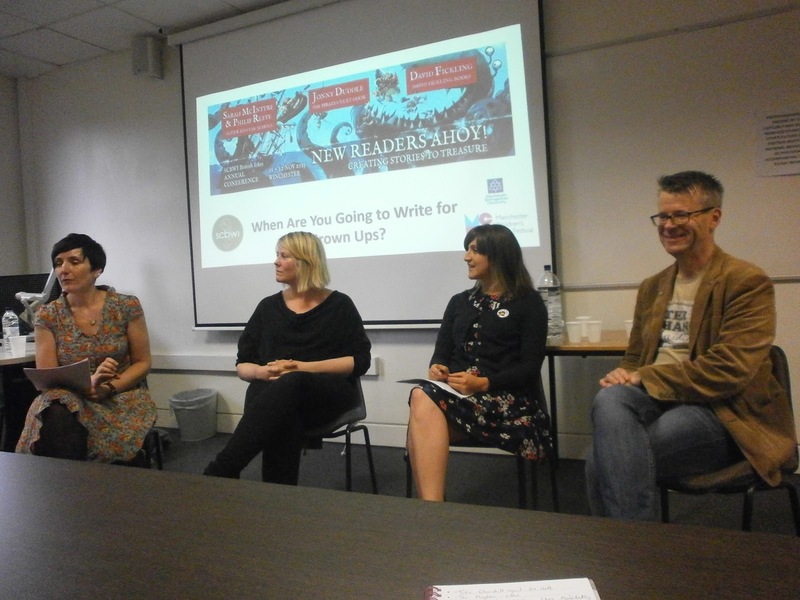 The topic up for discussion was: ‘When Are You Going To Write For Grown-ups?’ – What is the worth of creativity for children? The event was chaired by our very own Marie Basting and the panel consisted of: Julia Churchill – literary agent with AM Heath, Jon Mayhew – author (published titles include Mortlock, The Bonehill Curse and The Demon Collector) Kate Pankhurst – illustrator (she has illustrated stories by the likes of Judy Blume, Anne Fine and Steve Hartley) and is now an author-illustrator (of the Mariella Mystery series). Marie Basting: Could we start with your responses to original question? Julia Churchill: I was a little foxed by the premise. To me, children are people… so then the question becomes a more general ‘What is the worth of creativity?’ I look for the same things in a book for children as I would in a book for adults. Does the writing make me laugh? Does it make me cry? Does it make my spine tingle? Kate Pankhurst: I think the general theme is really worthwhile. For me it’s about allowing space for reading – in schools and in libraries, where increasingly it seems that space is being squashed. Sometimes people say things to me that imply children’s books are somehow simpler or easier things to create. They’re not! 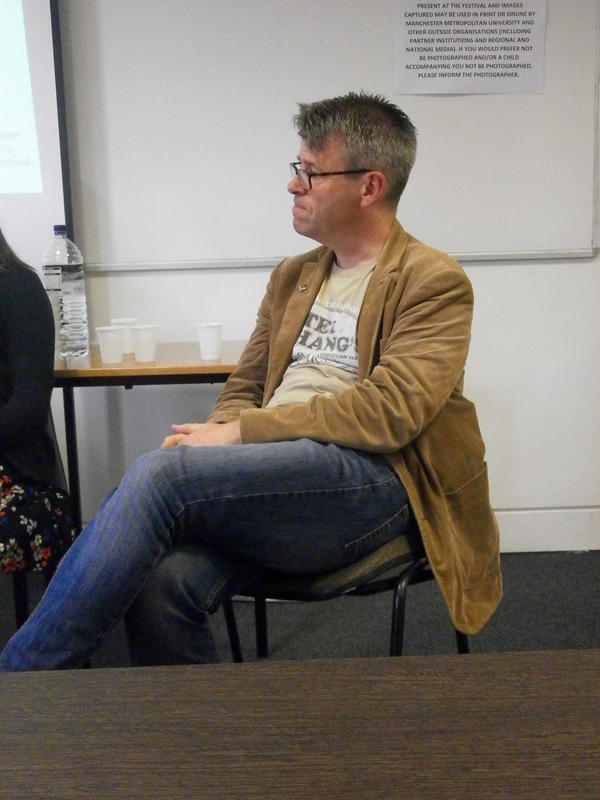 Jon Mayhew: It’s 30 years since I graduated from Manchester Polytechnic [which later became MMU]. Around that time, me and my brother-in-law tried to create a computer game for the ZX Spectrum. He had the technical know-how and he asked me to come up with some sort of story or plot. He said to me, ‘How hard can it be?’ Very, as it turned out! It took us ages. Then we gave it to my 8 year-old nephew… and he completed it in less than 5 minutes. Do not underestimate how difficult writing for children is! Julia Churchill: I think what we have to remember is that a lot of intelligent, sophisticated, skilled people work in children’s publishing. For me, the worth of a book comes from it being read. I don’t make value judgements about the text itself or who it’s aimed at. The five-year-old picture-book reader and the literary adult reader are both looking to be transported. Kate Pankhurst: As a child, the characters you read about and the places you go to in your imagination all feed into the person you become. Children’s books are about empathy too, putting yourself in someone else’s shoes. 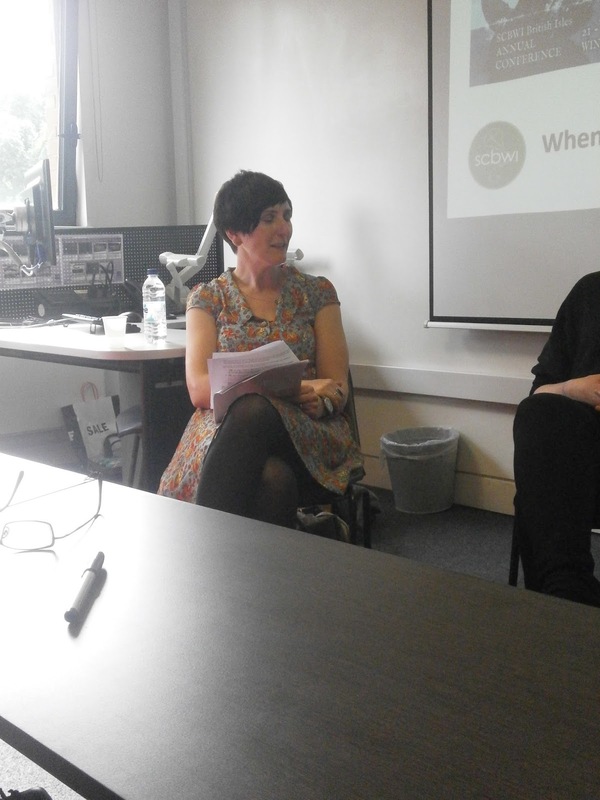 Marie Basting: Do you think we value creativity [creating for children] enough? 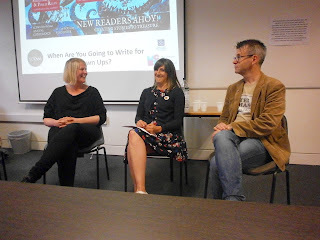 Kate Pankhurst: When I heard Chris Riddell was the new children’s laureate I did a little dance! I don’t think we promote visual literacy enough, so it’s great to draw attention to the value of illustration, as Chris intends. All children make marks, all children paint and draw but, as you get older, ‘art’ becomes seen as something you are either good at or not. I really like Chris’s idea that drawing doesn’t have to be perfect. Draw every day. Draw as a family. Thinking visually is a fantastic way to be creative. Marie Basting: I guess this links in with Sarah McIntyre and her Pictures Mean Business initiative? Kate Pankhurst: I’m so glad someone has stood up and said that. If you’re just starting out [as an illustrator of children’s books] it’s hard to speak up about things like how visible your name is on a book. With first readers/early chapter books the illustrators name often doesn’t make it onto the front cover – it’s usually buried in the imprint details. It’s hard enough to make a living as an illustrator anyway. Being given a visible credit for your work makes it easier to do school visits and festivals too. Julia Churchill: I must confess I hadn’t even thought about this until Sarah mentioned it. I represent authors, and it never entered my head. There’s so much that illustration brings to books, especially picture books. But I’m learning. In future I will credit the illustrator when new books come out. Jon Mayhew: If you value yourself, others will value you. Julia Churchill: I think parents can sometimes be too quick to pull children away from picture books, which is a real shame. 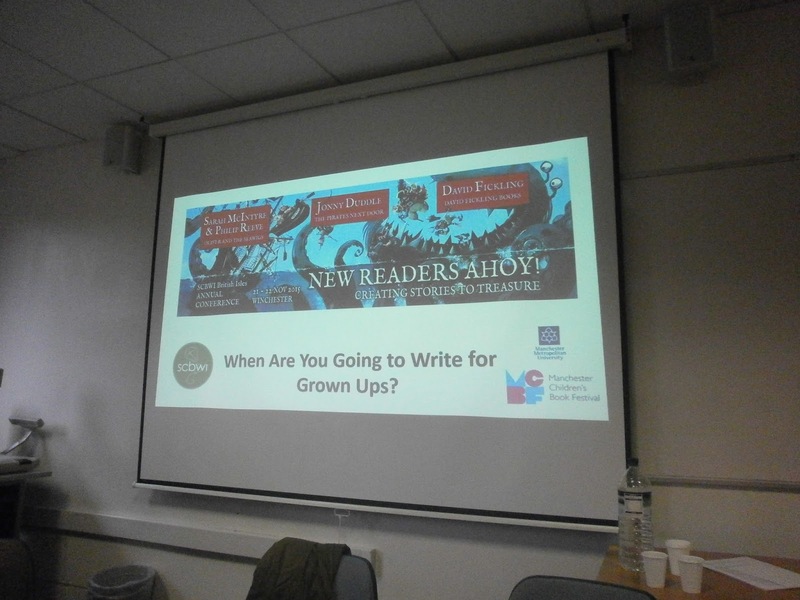 Jon Mayhew: There are some picture books that work really well for older children. When I was doing my teacher training I came across a book called Rose Blanche [by Roberto Innocenti and Christopher Gallaz] which shows the rise of fascism, as seen through the eyes of a young German girl. It’s an amazing book which I used it a lot with secondary school children. 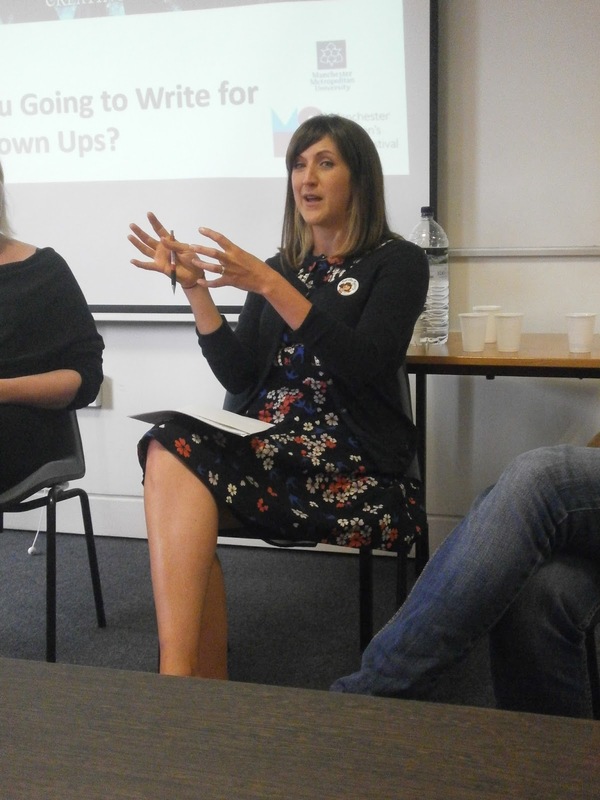 Marie Basting: What about the growing trend of celebrities writing children’s books? Do you think this is a good thing or a bad thing? Jon Mayhew: It depends how good the book is. If you take someone like David Walliams or David Baddiel – they’ve had a lot of success writing comedy and writing for TV, so why shouldn’t they write children’s books too? Julia Churchill: The Frank Lampard books are very successful. A lot of children, mainly boys, are reading those books, which has to be a good thing. I take a pragmatic view. They’re books, and it’s business. 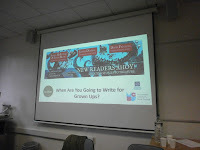 Jon Mayhew: I did a workshop in a school today for Year 8 [2nd Year at secondary school]. At the end a pupil came up to me and said, ‘That was great. I was just allowed to think about whatever I wanted.’ I think it’s essential to give kids freedom in their reading. The advice I often give is, ‘Go back and find the last book you really loved – it doesn’t matter what it’s about or who it’s aimed at – and read it again.’ I think the same applies to adults as well as children too. 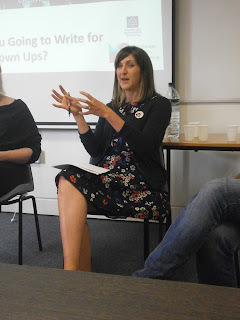 Jo Dearden spent 15 years writing about other people’s stories – as a reviewer and feature writer for various TV listing magazines. 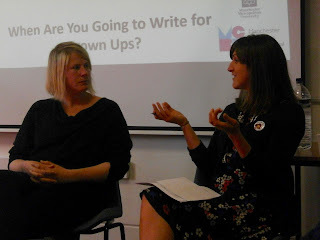 Three years ago she attended an Arvon course on writing for children. She loves writing didactic rhyming Picture Book texts with copious illustration notes. Despite this, her story ‘Betty’s Bellybutton’ was recently placed third in last year's Winchester Writer’s Competition and she has previously had a story shortlisted for the Mumsnet/Walker Books Book of Bedtime Stories. 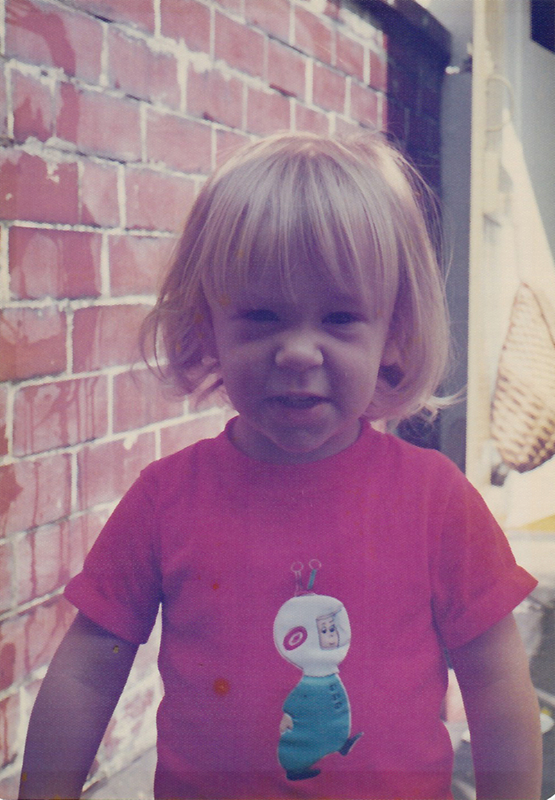 Jo lives in Rawtenstall, Lancashire along with fellow SCBWI-ers George Kirk and Steve Hartley (only in the same town though, not in the same house… that would just be weird). Haha Jo Rawtenstall is the place to be! We could consider setting up a commune for children's authors.